Dianne is a highly successful dog trainer with over 25 years of experience, which includes private and public classes, behavior modification consultations, service dog training, and therapy dog training. Dianne’s greatest passion is helping people to better understand their dogs in order to strengthen the relationship between dog and human. The focus in all her classes is on how dogs learn and the “why” behind their behaviors. Dianne uses positive, scientifically proven, non-forceful training methods to emphasize the relationship between dog and human. Dianne has volunteered with local animal shelters for more than 15 years and has been involved in animal rescue for the past 12 years. 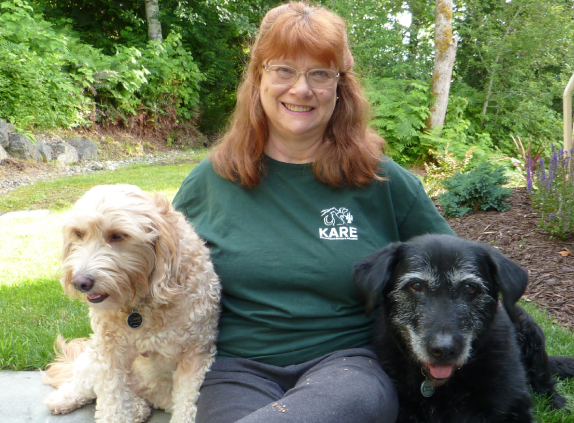 She is the co-founder of Kitsap Animal Rescue & Education (KARE). Her professional certifications include Karen Pryor Academy Clicker Training Partner, Certified Professional Dog Trainer through the Certification Council for Professional Dog Trainers, and Certified Therapy Dog Evaluator for Pet Partners. She updates her credentials with frequent continuing education courses in animal behavior and training. Do you need your pet evaluated/certified? Visit our Evaluations & Consultations page to learn more.